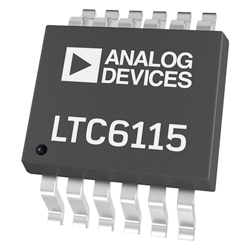 Analog Devices LTC6115 High Side Current and Voltage Sense is a versatile combination offering design flexibility with superior device characteristics. The device offers ±500µV maximum offset voltage for current sense and maximum ±0.15% voltage sense total gain error. The device monitors current by sensing the voltage across an external sense resistor. The sensed voltage is converted to an output current, then is available to be translated to a voltage by an external resistor, ROUT. The device is a perfect choice for load current warning and shut-off protection control due to its fast response time. The device is perfect for accurate voltage monitoring with the included internal 1MOhm resistor divider and a precision voltage amplifier. Maximum use of the amplifier’s rail-to-rail output is a result of the full-scale output voltage can be configured by external gain resistors. The resistor attenuation of 40, allows sensing of up to 100V on the VIN pin. The device is suitable for precision high voltage monitoring in telecommunications, industrial and automotive applications. The device is available in a 12-lead MSOP package.